Been tearing the big sunfish up here in TX. I go between 3 and 4 times a week and catch at least a couple dozen every time I go out. Real good solid fish between 9 and 11 inches long. No limit on sunfish down here so I've been putting a lot of fillets in the freezer. 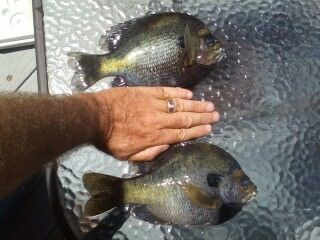 I catch bluegills, redbreast, shellcrackers and hybrids in the local lake from a float tube. Always a good time. Nice looking flat fish flags. I know there are many different varieties of gills and sunnies from all parts of the country. 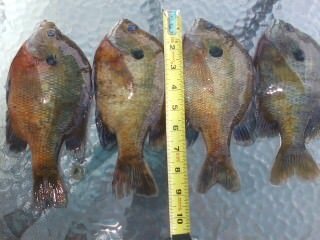 Those look similar to our blue gills up here in New England. Our Sunfish are more orange colored especially on the bottom and look like this.. Ours rarely will be 11" though and the larger ones are normally just under a pound. I did catch an 11" gill last year that was 1.41 and was the biggest I have ever caught. Must be fun in a float tube. Aren't there some things in the water down there that are not good to encounter especially in a tube? My TX time at Lackland AFB and later at Sheppard many years ago introduced me to lots of snakes and spiders that weren't fun to be around. Last edited by Champlain Islander; 07-17-2018 at 12:43 PM. Put these in the freezer yesterday. The cutting board is 12 inches wide. 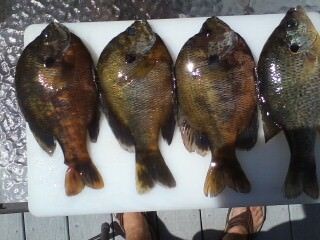 he second fish from the right is a reall slab of a gill no matter where you are fishing! Wow a monster. They are a blast to catch on lite tackle. I went out this morning and got a 25 limit on crappie. Decent fish but nothing over 13"